Departure control is typically located on one of the lower floors in the control tower or in a control center. The traffic controllers in departure control cannot see the aircraft in the air, but they can follow them on their radar displays. Traffic controllers in departure control take over responsibility for the aircraft from tower control when they pass through an altitude of about 500 meters. This happens when the tower controller instructs the pilot to change radio frequency and contact departure control. The departure controller ensures that the aircraft maintain required separation to other aircraft after departure. When an aircraft takes off, it is the departure controller who gives permission for the aircraft to continue the climb and proceed on course in accordance with the clearance previously given to the pilot by the tower controller. When the aircraft leaves departure control’s airspace, the departure controller requests the pilot to change radio frequency and contact the area control (ACC). 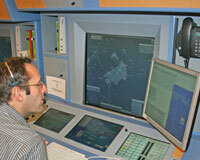 Approach control is typically located on one of the lower floors in the control tower or in the control center. The traffic controllers in approach control cannot see the aircraft in the air, but they can follow them on their radar displays. The traffic controllers in approach control have the responsibility of maintaining the required separation between aircraft that are approaching the airport. The traffic controllers in approach control take over responsibility for the aircraft from the area control when the aircraft comes into the approach control center’s area of responsibility. This happens when the traffic controller in the area control instructs the pilot to change radio frequency and contact approach control. The traffic controller controls the aircraft’s course, speed and altitude, making sure that all approaching aircraft come in like pearls on a string. During busy periods the traffic controllers pack the approaching aircraft so that there are only about 5 km between them. When an aircraft is about 15 km from the runway, the traffic controller requests the pilot to change radio frequency and contact tower control. Naviair has tower, approach and departure control at the airports in Billund, Aalborg, Aarhus, Roskilde, Bornholm and Copenhagen.